As you approach Traverse City and continue on iconic M-22 into the quaint town of Northport, you’ll find this beautiful 19th century barn restoration. 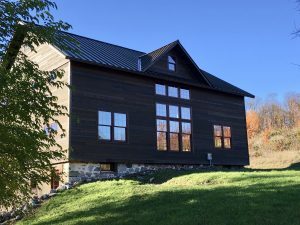 Living in another building located on the property, owners Jim and Laura Dybevik have slowly sought to transform the barn into a gorgeous living space plank by plank. This nearly $800,000 project captures the authenticity and timeworn feel of a bygone era while incorporating modern amenities that enhance energy efficiency and beautifully accent the age-old charm of the barn. Projects like this demonstrate our attention to detail and love for helping clients craft exactly the kind of living space they envision, while also incorporating best practices in energy efficiency and sustainability. Structurally insulated panels (SIPS) wrap the exterior and roof. Structurally insulated panels contain an insulated foam core which adds energy efficiency to a durable and cost effective structural facing. The panels allow for an energy efficient exterior while preserving the original siding and roof which can be seen from the interior. The rock and mortar foundation is original and is comprised of fieldstone found on site almost 200 years ago. Structures from this era incorporate mortise and tenon joints. These are simple, strong joints woodworkers have incorporated for centuries without the aid of modern innovations like nails and bolts. This feature enhances the beauty and authenticity of the structure. Typically used for storing, threshing, and winnowing grain, the threshing floor has been beautifully restored preserving the timeless look without compromising its integrity. An in-floor heating system warms the basement and first floor while new cabinetry and cement countertops accent the timeworn feel of the interior. Check out these other projects we’ve had the pleasure of working on!